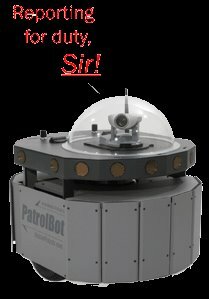 Cypress Computer Systems, a security technology integrator, is showing off MobileRobots second generation PatrolBot at a show for security professionals, ISC West, in Las Vegas. The latest version of the rolling security gurad robot includes remote video, two-way audio and options for all kinds of additional sensors. The guard robot can interface directly with the security system so that it will automatically respond to emergencies without human intervention. Other options available are touch-screens for guide duty or office delivery service. CypressWorld - Cypress Computer Systems, Inc.